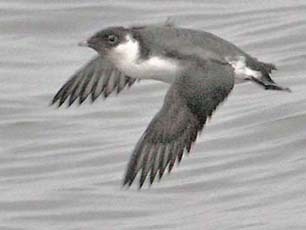 The Monterey Seabirds trip on 27 Oct 2007 proved by an extraordinary trip for pelagic photography. Seas were very calm and winds, if any, were from the east. We were able to cruise all the way to Pt. Sur. Numbers of Northern Fulmar (header above) and Bonaparte's Gull (right) were impressive: over 500 fulmars and 200 gulls, respectively. 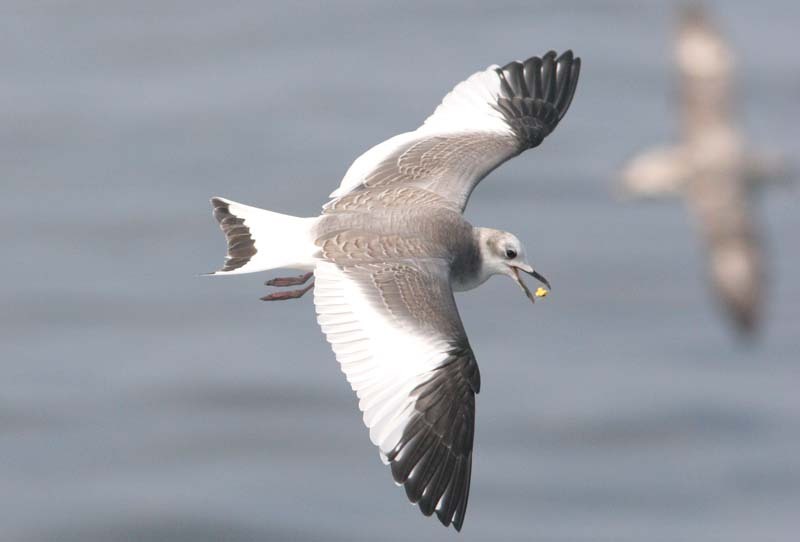 But if the dainty Bonaparte's were nice, they paled in comparison with a very friendly young Sabine's Gull — whose occurrence was right at the end of the fall season for them — which battled for anchovies and popcorn with the larger gulls as the stern (photo below). Almost as impressive were the views of alcids on the glassy surface. 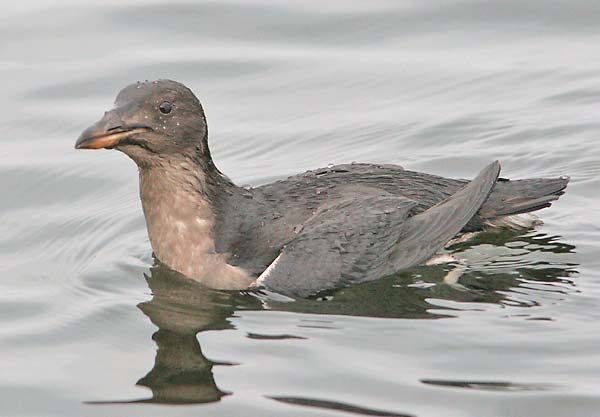 Five species were recorded — Common Murre, Pigeon Guillemot, and Cassin's Auklet among them — but the best views were of this hatch-year Rhinoceros Auklet (right) and this adult Ancient Murrelet (below). Rarely is one able to approach the latter species as closely as this individual right off Pt. Pinos. Procelarids were also numerous. 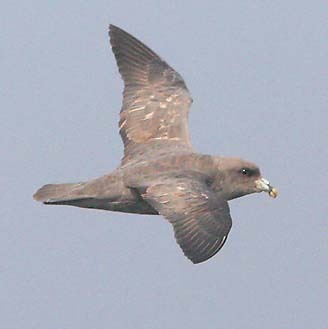 The fulmars were mentioned above; most were dark morphs with just a handful of white individuals. Including Northern Fulmar (left), there were 7 species of shearwater, plus Black-footed Albatross. 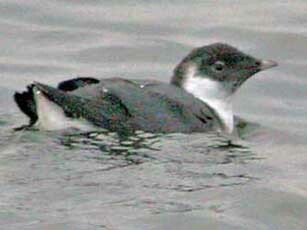 The rarest was a distant Manx Shearwater spotted by Todd Easterla. But it was the show of Flesh-footed Shearwater that impressed: likely 5 different birds. 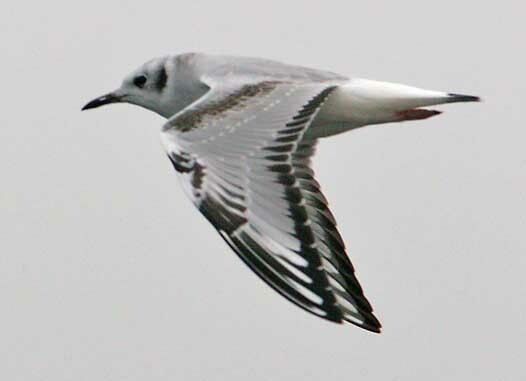 These were in fine, fresh plumage, as shows well on the one (below) that permitted close views at the stern of our boat. 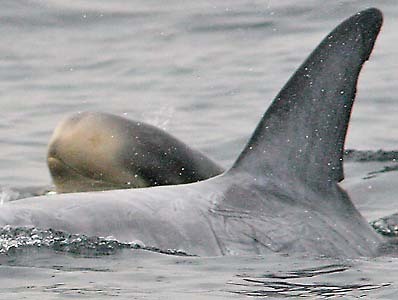 While the pelagic mammal show was not as impressive as the 15 Sep trip, there were some delightful cetaceans. 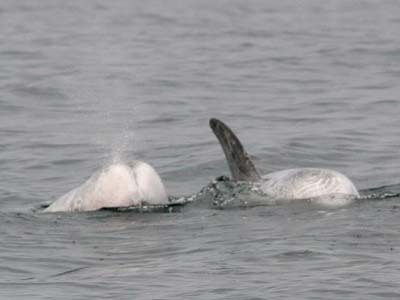 We had a couple pods of Grampus, often called Risso's Dolphin, and one that permitted rare head-on shots of adults (below left) and had a nursery group of just-born youngsters (below right). But perhaps what left us talking the most was a pair of very friendly Humpback Whale down near Pt. Sur. That's Dan Singer (in blue leader cap) and Eric Preston, among others, looking straight down at these giant beasts. The two Humpbacks spent 20 minutes playing with the boat — swimming directly under us, spraying the passengers with forceful blows, and bellowing loudly ["just like a dinosaur," explained Roger Wolfe; when asked how he knew what a dinosaur sounded like, Roger explained that he'd seen Jurassic Park]. Many, like Eric Preston, were left holding their huge lens in near embarrassment . . . these whales were much too close! 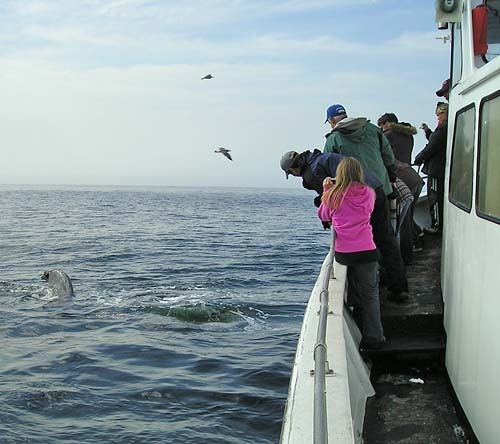 Photo wizard Jeff Poklen, though, pulled out is smaller lens — that's him (below) aiming at the pair as they surface next to the bow. In 40 years of pelagic trips, I've never encountered such 'friendly' whales. They seemed to be enjoying their time with us, although it is dangerous to anthropomorphize these animals. Perhaps they were trying to figure out a way to get rid of us. Whatever it was, the most common word heard on the boat was "awesome."